Let's make your profile page stand out and look great! Markdown is a a markup language that allows to you to control how your text looks. It is easy to read and understand by most people, and works similarly regardless of browser or platform, while still keeping pages lightweight. Here we'll talk about all the different ways you can style text on smash.gg. These rules only apply in boxes where you see the markdown symbol in the bottom right. To create headings for your paragraphs and sections, you can add hash signs before the line to signify the level of importance the line should have. # This is the highest level of the text. ## This is the second highest level of the text. ### Each hash mark creates a new level of text for headers. #### These are useful for subsections for large chunks of information. ##### There are six different headers you can use for text. ###### This is sixth section! You can apply bold, italics, quotes, and strike-through to your text. They can also be used in combination to allow for multiple styles at once. These styles will be ignored if applied to headers. Using a greater-than symbol before a line will turn it into a quote. Using multiples of this symbol will nest the quotes further down. >> There's gonna come a point where you'll forget about what happened and you're gonna wanna come back at me. >>>> SERIOUSLY, don't get hit. 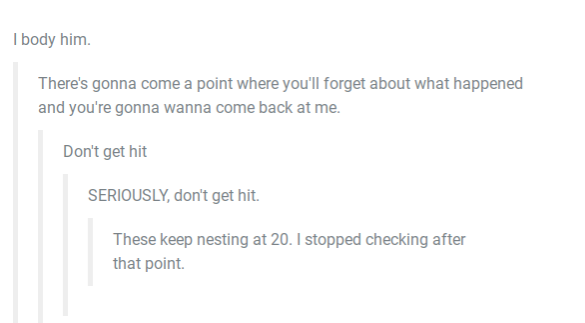 >>>>> These keep nesting at 20. I stopped checking after that point. When including or quoting code (good for discount codes, lobby codes, or other character specific information), there are two different options. For inserting a block of codes, you'll need to place three grave characters before and after the desired block. For code in between normal text, just use one on each side. The lobby code is `weloveesports`! 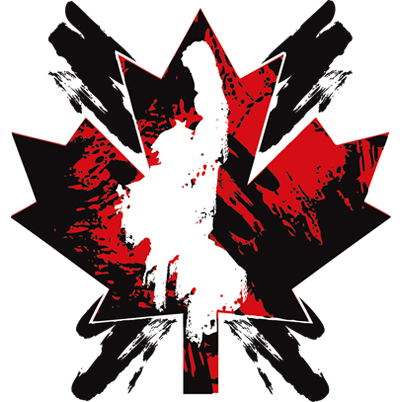 Here's an example with the Canada Cup logo! If you want text or an image to hyperlink, you'll need to encase the text between brackets, and the intended link directly after, in parentheses. You can also make images into links! This is useful when you need to link larger versions of displayed images. To make a list, simply add an asterisk before each line item! For numbered lists, you can precede text with numbers instead. To nest your lists, put four spaces at the beginning of each new line of the list. By default, all text in Markdown fields are aligned to the left. You can also align to the right, or center the content by wrapping the text in div tags. The below code shows both implementations. Be concise. Short and sweet is usually the best way to convey information. Use images and color when possible! Emoji make excellent replacement bullet points. Keep your content up to date! Users should always be able to go to your page to get relevant and accurate information. In the event something doesn't look the way you expect it to, be sure to check for inconsistencies in your markdown!